PATTAYA:--Nongprue Municipality officials plan to build water barriers, dredge canals, and look into other measures to address chronic flooding. 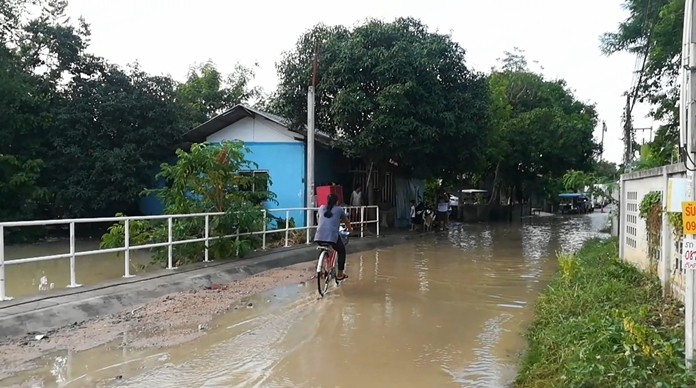 Berkchai Ninpanan, Nongprue’s acting Sanitary Engineering Office director, said Apr 9, coordination with Pattaya City is needed to handle flash floods and slow drainage in the hard hit areas of Eakmongkol 4/3 Village, and Na Pakdee Village, Nong Maikan Eua Athorn Village, Soi Marbyailiab 43, and along Pornprapanimit Road at the new cemetery. He said poor drainage causes floods and adds to the problem by keeping unsanitary flood water inside homes. We seem to hear similar pledges every year. Do you think they will ever realise that it may be prudent to dredge and keep clear drainage canals before the rainy season actually starts?